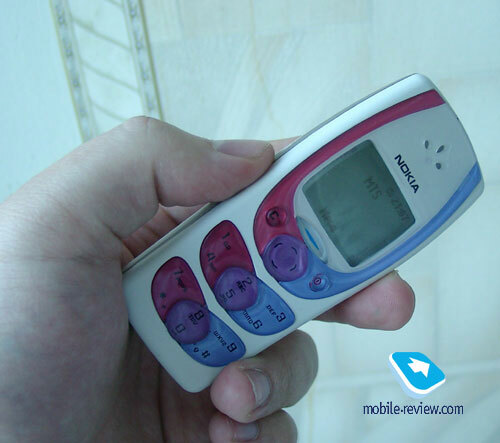 Nokia presented the Nokia 2300 model back in last year, in Moscow; however this model went for sale only now. This phone is targeted for the youth, and is presented in two colors – pink and grey. If the first one is obviously made for females, then the second one is made for men. The design once again became the company’s main target, the keyboard is made of smooth plastic, it pleasant when you touch it, the keys are oval and get crossed between each other. The keyboard looks unusual, but when you are actually use it no problems are encountered. I believe that this is the seldom exception when unusual keyboard design is actually convenient. The backlight is not even, the keys get highlighted differently, depending on the plastic’s color. For some reason this causes dissonance, typing without any source of light around is not as pleasant, as doing the same operation during the day. If you look at the phone’s bottom you will notice two ports. One of them is made for charging the phone up, and the other is for the headphones. They play primary role for this model, since it has built-in radio, and this is its strongest feature. The phone’s top features hole for the strap, and that’s about it what can be told about the outlook, unless the model did not have its screen. 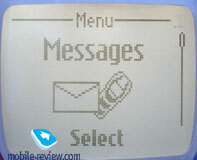 The screen itself is monochrome, and can display several text lines, the screen’s backlight color is light blue, steel (pastel blue). Nowadays every manufacturer is trying to provide its phones with at least some kind of color display Nokia had chosen other direction, and in my opinion it is right. A simple phone for youth does not always require presence of color screen, here the design and presence of these and those features targeted for the youth are important. The phone’s size is convenient (107x46x21 mm), its weight of 92 grams is comfortable as well. The phone comes with Li-Ion battery which’s capacity is 850mAh, Nokia claims that the phone can work up to 400 hours in stand by mode and up to 5 hours during the talk. 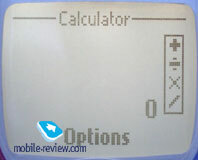 The real specifications which we were able to find out via using the phone in Moscow were significantly lower. The phone works for about 5 days with 30 minutes spent for talks and 1.5 hours of radio playback. It takes about 2 hours in order the phone to charge up. 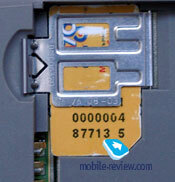 SIM-card holder is presented in a way of hinged flap - no problems with this one were encountered. 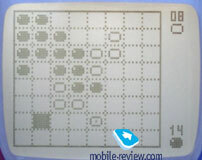 Except for the different screen and radio Nokia 2300 is almost identical to Nokia 1100. Even though it has four-positional navigational key, it can be used only in games, for example when you are choosing additional symbols in SMS input mode, you can use only horizontal scroll. Press central key in order to access main menu. It’s traditionally presented with a set of animated icons provided with definitions. All sub-menus are arranged in lists. Key number navigation is supported. Press the “C” key in order to access upper menu level. Menu scrolling is done with the help of appropriate cursors. The user can create its own Custom menu – Active, which will feature the most frequently, used functions. 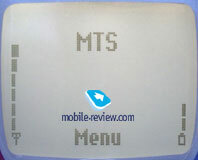 This menu can be accessed by pressing right on the navigational key. Pressing left will lead you to the Messages section, NEW SMS to be precise. Phone Book. In order to access the list of phone book’s entries – press down the cursor key. 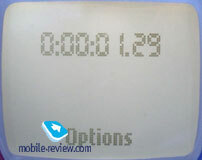 Numbers from SIM-card and phone’s memory are displayed at once. Common list has seach option. 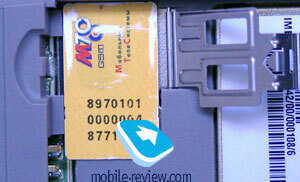 50 entries can be stored in phone’s memory, only one number can be attached to it. You can bind various melodies for the entries. Messages. 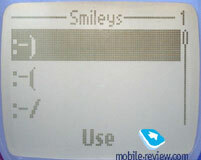 50 SMS can be stored in phone’s memory. Predictive text input – T9 is supported. Subscription feature is rather unusual for this type of phone, you can create up to 6 lists with 10 contacts in each and send one message to several numbers at once, Chat support is not typical either, however it’s present. 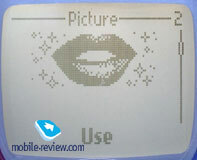 The phone supports Nokia Smart Messaging, and even 8 pictures are present from the start. Plus there is a set of 8 smiles (and two empty slots for your own). 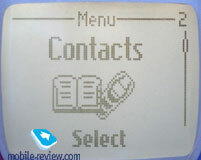 The digit “8” becomes lucky for this phone, there are 8 pre-installed message templates. 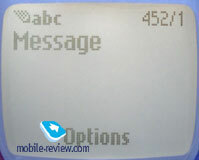 Joined messages are supported. Call list. Basic set of last received/dialed/missed calls with date and time for each entry. There are three lists, it’s typical. 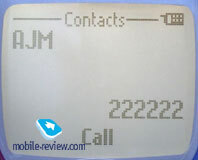 Dialed calls list can be accessed by pressing Call button during the stand by mode. I find combined list’s absence not a very wise decision. 10 numbers are stored in each list. The call length and cost is shown here as well. Sounds. All sound settings are located here. Choose ring tone for calls, messages, alerts; it's volume, etc. Profiles are rather interesting, you can personalize each profile and use it, which is very useful. Settings. 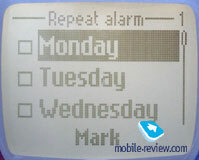 Choose date, time and some additional settings like key auto key lock. That’s about it, actually. Alarm Clock. 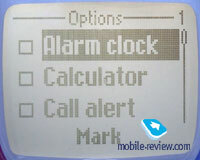 Alarm Clock can be set for single abrasion or for work in definite days which are selected from the list. Reminder. 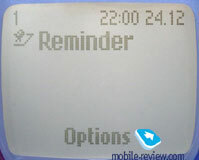 You can create short reminders and insert notification for them. Nothing special. Games. 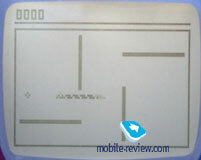 The phone has two games - Snake II (good old Snake), Space Impact + (arcade, shooter), Opposite. In my opinion, they were added in order to enrich phone’s functions, and not for entertainment needs. Extra. 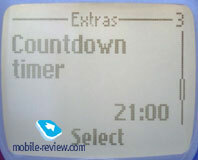 Calculator, which is unit converter as well, stop watch, countdown, melody editor, screen saver (turns activated constantly or after a period of time, you can't choose the picture for it). Radio. 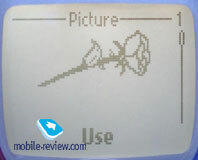 This feature’s realization is typical for Nokia phones. You can choose FM stations, keep them as presets, list. The garniture allows quickly moving through the stations just by pressing the button. You can also listen to the radio when loudspeaker is turned on. Network quality, sound volume in dynamics is traditional for Nokia phones (now I really want to write that the quality is two-three years old and is still good, meanwhile the platform remained the same). 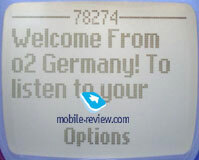 Since it is a phone targeted for youth it is interesting because of its radio, except for two things. The first lack is absence of WAP-browser and GPRS. Since synchronization with PC is not available, you will not be able to download new ring tones or pictures. The lack of polyphonic ring tone (even though it is pleasant for your ear, it is the usual one) will not give this phone additional points. The ring tone volume is loud enough and is fine for most conditions. Vibrating alert power is average, there are times when you might not feel it. The phone will be released in the end of March, its price will range from 140-150 dollars. In my opinion the price determined by Nokia is completely unreal and is not correspondent to the situation on the market. You can get fully-functional phones for the same amount of money, that feature all possible technologies and color screen, even though they do not have radio. But if we look at the previous models experience, radio is just an additional feature, which is not vital for most of the consumers. The real phone’s retail cost which will allow this product being competitive and get high sales is about 100-110 dollars including the overpriced Nokia brand. In reality considering the production cost its price can not be higher than 90 dollars. Seems that this model will have a huge price drop incoming shortly after the release, else it will not be in demand on the market.